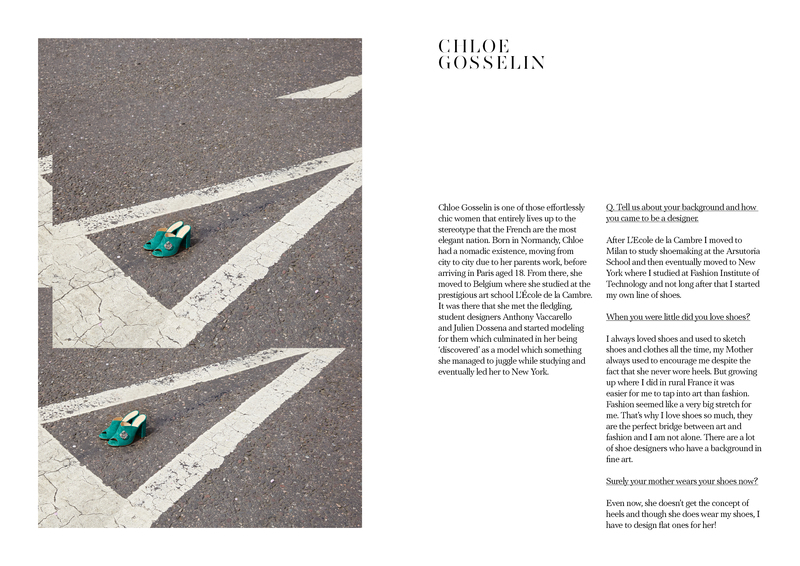 Make catches up with French shoe designer Chloe Gosselin to find out what is like to be in her shoes. Chloe Gosselin is one of those effortlessly chic women that entirely lives up to the stereotype that the French are the most elegant nation. Born in Normandy, Chloe had a nomadic existence, moving from city to city due to her parents work, before arriving in Paris aged 18. From there, she moved to Belgium where she studied at the prestigious art school L’École de la Cambre. It was there that she met the fledgling, student designers Anthony Vaccarello and Julien Dossena and started modeling for them which culminated in her being ‘discovered’ as a model which something she managed to juggle while studying and eventually led her to New York. Q. Tell us about your background and how you came to be a designer. A. I was born in Normandy but grew up all over France as my parents moved around a lot. I had a year in Paris when I was 18 before I moved to Belgium to study fine art at L’École de la Cambre. Growing up where I did in rural France it was easier for me to tap into art than fashion, but I always loved it. While I was studying in Belgium I became friends with Anthony Vaccarello of Yves Saint Laurent and Julien Dossena of Paco Rabanne who back then were just fashion design students! I started modeling for them which lead to me being discovered as a model. So I modeled a lot while I was studying in Europe as it was easy for me to travel around, work as a model but continue my studies. After L’Ecole de la Cambre I moved to Milan to study shoemaking at the Arsutoria School and then eventually moved to New York where I studied at Fashion Institute of Technology and not long after that I started my own line of shoes. Q. When you were little did you love shoes? A. I always loved shoes and used to sketch shoes and clothes all the time, my Mother always used to encourage me despite the fact that she never wore heels. But growing up where I did in rural France it was easier for me to tap into art than fashion. Fashion seemed like a very big stretch for me. That’s why I love shoes so much, they are the perfect bridge between art and fashion and I am not alone. There are a lot of shoe designers who have a background in fine art. Q. Surely your mother wears your shoes now? A. Even now, she doesn’t get the concept of heels and though she does wear my shoes, I have to design flat ones for her! Q. So how did you start your label? A. The decision to design shoes was quite organic. I was still modeling but I had my daughter and it was while I was looking after her that I started to have time to get back to my sketchbooks. The idea to create my own line in shoes suddenly became very clear as what I wanted to do. I took a very practical route to study at the courses that I needed to get the technical knowledge on how to make them both in Milan (at the Arsutoria school) and New York (at the Fashion Institute of technology) and then when I had finished, I went off to Italy to find factories, go to the leather shows and get familiar with that world. The decision to start my brand was also influenced by my daughter. For the first few years of her life, I was still working as a model, but I had a lot of time with her, playing with her and it made me want to do something creative, to make her proud of me! A lot of my contemporary’s had invested in property and I wanted to do something different and the idea of creating my own brand felt right. I think drawing with my daughter and this brought me back to my sketchbooks and as I had always loved shoes it seemed totally logical. There are some great female designers in the shoe world, but the majority are men, particularly in the more classic and timeless design world and I wanted to put a female spin on that male orientated field. I wanted to put little twists on classic shoes to so that they are relevant in five or ten years and are not overly ‘trendy’. A. Nature inspires me a lot; leaves, in particular, have inspired many design features. Q. Some shoes are inspired by the fabrics and we design shoes around them but most of the time design comes first as I find its more organic to take your pencil and sketch a shape. My background in painting means that I like to play with colours, textures and mix materials, for example, snakeskin with satin. The ‘Holi’ festival in India really inspired the Spring Summer 2018 collection. I love the meaning of the festival, which is the celebration of good over evil. It’s also a joyful celebration of colour. Q. What is new for this collection? A. The new signature feature of the SS18 collection is the elasticated band across the foot, which is also being used in AW18. I love it as there a sense of easiness with that. I feel that women more and more want to wear things that are fashionable but also comfortable that fit their lifestyle. For me, fashion seems less put together than before, less rigid. Q. How do you tackle the issue of sustainability in your design? A. For me the shoes were always going to be made in Italy because they make the best shoes but also it’s a real craftsmanship there, we are not talking about mass production. We are consciously a pretty small business. Everything is handmade and crafted. The people who make my shoes are artists. It is not about making more it’s about doing it well. So I always feel that there is sustainability inherent in the shoes. They are not mass-produced or made with lots of waste or environmentally damaging chemicals. Also, my hope is that due to both their classic design and craftsmanship, they will last a really long time and remain a working part of your wardrobe for years. Q. There is much talk of using vegan fabrications in the accessory world at the moment, would you ever consider a vegan shoe? A. 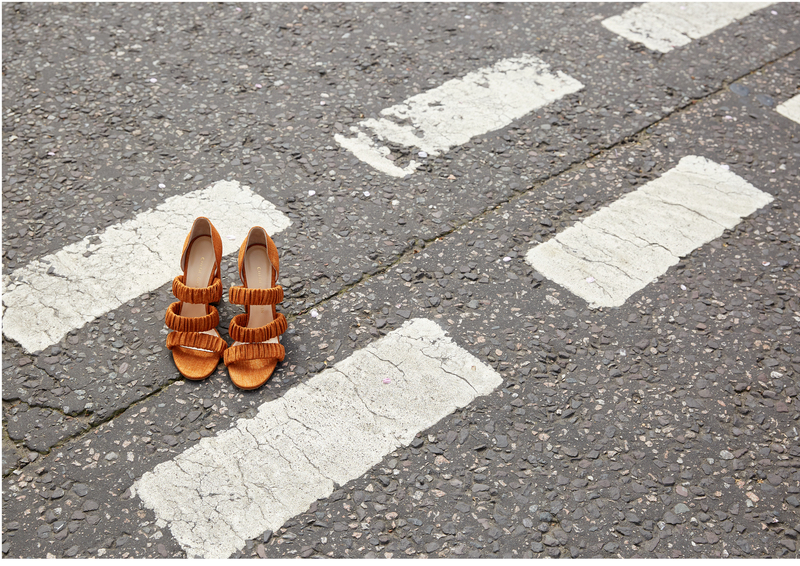 The lining and the soles are always made from leather, but we do use raffia, satin and other vegan-friendly fabrics. 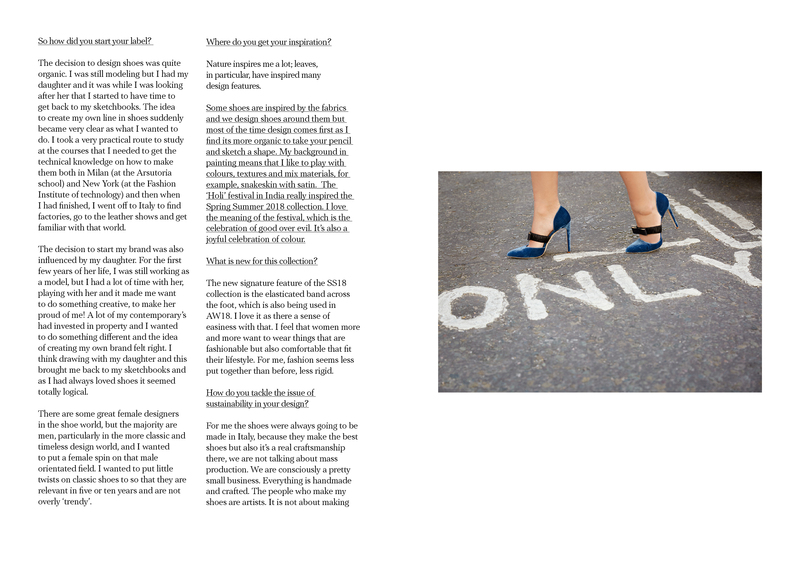 I don’t want to create vegan shoes if I have to have plastic involved I don’t want to be contributing to that issue either, but I would love to find other ways. Plastic is here forever on this planet whereas leather degrades. It’s a difficult conversation, but we need to have it. Q. Who are your design or style heroes? A. For the first couple of seasons the shoes were named after poisonous flowers, but for the past few seasons I have named the shoes after female pioneers of various industry’s so I have the ‘Maya’ named after Maya Angelou and I have a new shoe in the next collection called the ‘Diane’ named after Diane von Furstenberg who has been a real inspiration to me. Q. Is your daughter Sky getting interested in shoes? A. I have a lot of vintage shoes for inspiration that don’t fit me, but they do fit her so she enjoys walking around my office in them. When she draws, she always draws women with profile sided feet with little high heels on which is exactly what I used to do as a child! Q. What’s next for the progression of the brand? A. We are working on a Cruise collection for the first time, so the collection has grown from doing two seasons to four. The current collection started with a conversation I had with the singer Tori Amos about mermaids! We were talking about the mythology of mermaids and sailors, so it’s fascinating to me how a conversation can result in a pair of shoes. Q. So can we expect fish scales or mermaid inspired sequins? A. Ha! No, it’s actually ended up coming more from the sailor aspect, so an oversized buckle and the use of fabrications like bamboo. It’s still early stages in the design so we will see how that inspiration manifests! Q. As our theme of the issue is Happiness, can we ask you what makes you happy? A. My daughter of course. When your life is so busy it can be really difficult to stand back from what you are doing and appreciate it. But my work really does make me happy, it’s amazing to be able to do a job that you love and turn your passion into an actual business and even better for me to be able to balance that with motherhood.